Crystal Cove is celebrating Book Club Bonanza and the Cookbook Nook is geared up and ready to participate. One of the planned festivities involves one of the book clubs traveling to various homes to eat and discuss the mystery the members are reading. Jenna Hart, co-owner of the Cookbook Nook, can’t wait to participate, but unfortunately things go seriously wrong when one of the hosts is found dead in her home during the event. Worse yet, one of the prime suspects is the chief of police’s mother, Pepper Pritchett. Can Jenna help exonerate Pepper without destroying her relationship with her police chief daughter, Cinnamon? 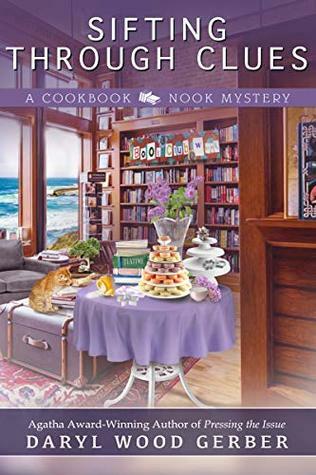 SIFTING THROUGH THE CLUES is the eighth book in the Cookbook Nook mystery series and can be read as a standalone story. Daryl Wood Gerber helpfully provides a quick cast of characters at the beginning of the book so that new readers can quickly jump into the series and enjoy the story. I have to admit that I can’t imagine reading one book in the Cookbook Nook series and not wanting to read them all! While I love the entire Cookbook Nook series, SIFTING THROUGH THE CLUES is probably my favorite book yet. Daryl Wood Gerber’s inclusion of the book club theme meant we had plenty of mentions of books other than just the usual intriguing cookbook references. In fact, I’ve added several of the cookbooks to my list to buy as a result! And oh, I love how Daryl Wood Gerber worked in references to her two other series and I can’t wait to hear all about Jenna and Rhett’s visit to Maison Rousseau! SIFTING THROUGH CLUES is another fun and engaging mystery series from the talented Daryl Wood Gerber. Not only will culinary mystery fans delight in this entertaining story, but I suspect book lovers everywhere will appreciate the numerous book references that are a centerpiece of the tale. Highly recommended!